Are you a fan of the New England Patriots? How about the Pittsburgh Steelers or the Dallas Cowboys? Maybe the Denver Broncos, Seattle Seahawks, or New York Giants? And that’s just the NFL. We could ask the same about the St. Louis Cardinals in the MLB! Or the Los Angeles Dodgers, the New York Yankees, or the Atlanta Braves, Philadelphia Phillies, and Toronto Blue Jays. And then we’ve got the New York Knicks and the Oklahoma City Thunder and the Los Angeles Clippers in the NBA. That’s a lot of sports teams, seemingly picked at random, you might be thinking. But you would be wrong, because we’re talking about team pride here. And team pride means slapping blue body paint on yourself and going into public. There might be some drinking and possibly making a fool out of yourself. But you do that in the name of your team. Because it must be done. What’s in the package? 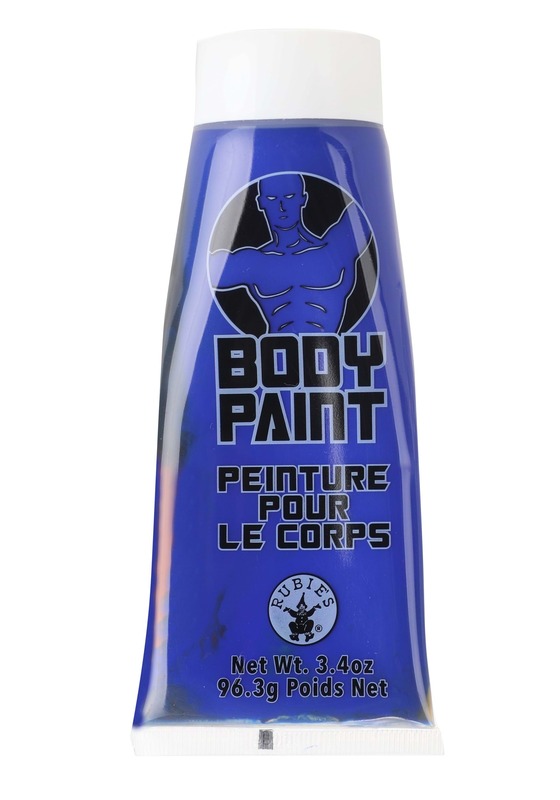 3.4 ounces (oz) of blue body paint. Apply it with your fingers or a sponge, neither of which are included. And it comes off with soap and water, which can’t be said for your team pride. Well it went on easy, stayed on nicely and washed off cleanly, what more could one ask for?